There have been plenty of versions of the Stormcast model that came for free with the White Dwarf back during the AoS release. A lot of them have been very well done, and this one is no exception. The non-metallic metals are spot on, with smooth transitions and crisp highlights. They have even added battle damage all over to really make him feel like he's been in the thick of things. It might be a little overboard in a few areas, but for the most part I think it works. 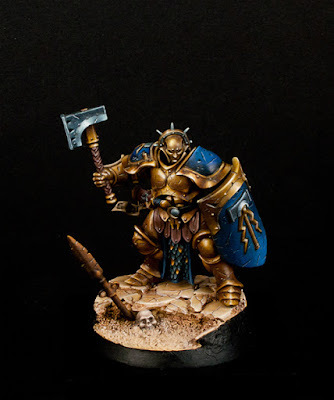 What makes this particular Stormcast Liberator stand out to me over all of the other ones out there are the color choices. While he has been painted in the traditional gold and blue color scheme, the gold has a slightly warmer and browner tint then most. On its own that's not a huge deal, but it's how it interacts with the other colors that makes it great for me. Instead of doing blue straps around his waist and the purple/red hammer haft, this hobbyist went for a warm brown. When you combine this with the desert basing, the bleach skull, and the severely rusted spear it creates an almost monotone palette. I think this is fantastic since it gives the mini an overall sepia feel and really make the blues pop and stand out. They are almost framed by all of the sepia tones. 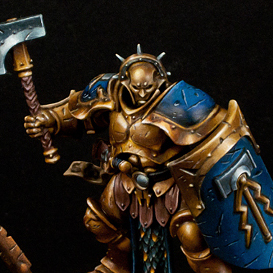 Even the silver on the hammer head has a strong blue tint, essentially making this mini just sepia and blue, with variations within the two colors. I would love to do something like this since it really challenges you to make the model still interesting with an extremely limited color palette. This mini certainly succeeded at it. Mengel Miniatures Painting Competition Winners!